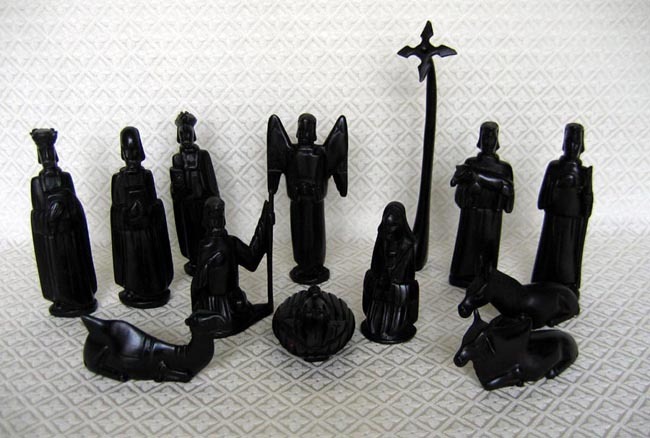 This Nativity set is hand-carved from ebony wood by an artisan who lives in Kitui, Kenya. The set comprises the following 13 pieces: a kneeling Mary and Joseph, baby Jesus in the manger, an angel, two shepherds (one holding a lamb), a camel, a zebu cow, a donkey and the three kings. The Star of Bethlehem shines above them all, held aloft by an artistically curved pedestal. The kneeling figures are each 4.5 inches tall, the standing figures 6 inches tall, the star’s pedestal 8.75 inches tall. The set was sent to us from our friend Steven, who runs an artisan workshop in a slum called Gikomba near the city center of Nairobi, Kenya. Steven also runs an orphan school to help educate the unprivileged; he works very hard to help others.